Max Planck scientists found that certain signal substances in nerve cells are not only responsible for the growth of the cells but also for directing them to the right muscle. The nerve fiber tracks in the brain of a healthy subject. Max Planck scientists created this model using a technique of magnetic resonance tomography that images the motility of water molecules and their preferred direction in the brain. Immunofluorescent image of the division of a human cel . The chromosomes are shown in blue, the centrosomes in red. 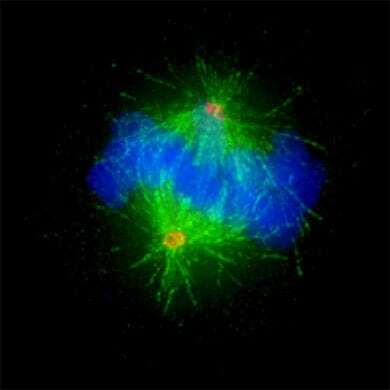 Centrosomes, composed of proteins, although only one thousands of a millimeter in size, play an important role in the division of cells by organizing the microtubli cytoskeleton (in green) that pulls the chromosomes apart. The atypical localization of ß-catenin in benign early stages of a human colon tumor is shown in yellow. Normally, this protein is found only at cell boundaries. If it is found also in the core of individual tumor cells it develops new properties. Most viruses are structurally complex units composed of thousands of molecules. A team of researchers from the NIH and the Max Planck Institute for Biochemistry succeeded in reconstructing the molecular architecture of the outer layers of an infectious Herpes virus by using cryo-tomographic methods, and learned spikes in the outer membrane of the virus play an important role in the infection process. Activity of a tumor suppressor in healthy skin cells. This microscopic image shows three skin cells. In each, the Cyld protein (green) surrounds the nucleus (blue) and prevents oncogene Bcl-3, a gene that can cause leukemia, among other diseases, from entering. The red structure is the cell’s cytoskeleton. The Max Planck Institute for Biochemistry has discovered that a defective Cyld gene may be the root cause of kidney, liver, uterus and large intestine tumors, since it is the cellular mechanism that activates and regulates Bcl-3. Max Planck scientists have found that the area of the brain responsible for self-control is separate from the area associated with taking action. This research can help explain psychiatric disorders for which self-control problems are prominent, including Attention Deficit Disorder (ADD) and substance dependence. The brain consists of a hundred billion nerve cells. Each of these cells is linked to its neighbors by many thousands of contact points. During brain development, young nerve cells must come into contact with the correct partner cells so that the brain can carry out its complex functions. In adults, contact between nerve cells is also constantly being set up and then dismantled. It is this continuous restructuring of the brain that allows us to learn and to forget. Scientists at the Max Planck Institute for Neurobiology have discovered that nerve cells can also obtain information about their neighbors without being connected, by using calcium signals that save the brain time and energy. 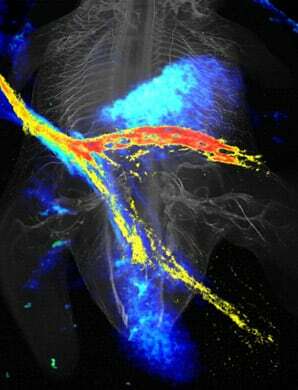 The nerve fiber tracks in the brain of a healthy subject. Max Planck scientists created this model using a technique of magnetic resonance tomography that images the motility of water molecules and their preferred direction in the brain. This research visualizes that functionally in the two halves of the human brain is linked. The green fibers are pre-frontal; light blue is pre-motor; dark blue is motorized skills; red is sensory; orange is parietal; violet is temporal; and yellow is occipital. Max Planck scientists have developed a new tool to visualize molecular processes in an isolated nerve cell under an electron microscope by using fluorescent reporter proteins. Synaptic activity regulates the local protein synthesis. Changes in activity and the resulting molecular changes could be responsible for the reorganization and stabilization of synapses. The scientists found evidence that this could be the molecular basis of learning. Every year nearly 10 million people around the world contract Mycobacterium tuberculosis, and about 4,000 patients die from the disease daily. This is the main reason why scientists worldwide have dedicated countless research hours trying to find a cure. Until recently, scientists assumed that mycolic acids (fatty acids that are necessary to preserve the resistance properties of a cell wall), form a thick, closed layer, however the Max Planck Institute of Biochemistry used a new technique called cryo-electron tomography to prove that model wrong. This has led to more targeted research, which is also being used in the development of chemotherapeutic drugs. A balance of synthesis and degradation of proteins is essential for learning processes and memory capacity. The hippocampus is a brain structure located inside the medial temporal lobe of the cerebral cortex. It plays major roles in short term memory and spatial navigation. Scientists at the Max Planck Institute for Neurobiology discovered that not only is the hippocampus’ activity dependant on proteins, but also that these proteins are an important mechanism for information storage in the brain.